Why Does my hard water make my laundry look bad? We would all like to think that we just throw the laundry in the washer and it comes out looking and feeling great. Unfortunately, there’s more to it than that. Your home’s water quality can make a big difference on how your laundry turns out! It is convenient to blame your washer and dryer, but the real problem probably is not originating in your home–it is hard water. It does not matter if you have a well or a municipal water supply, the majority of the water in the US is considered hard. Hard water means that it contains minerals like calcium and magnesium. The presence of things like iron and manganese will make it even worse. Hard water can cause a lot of laundry problems, and problems in other parts of your home. Why Aren’t My Clothes Clean? Dissolved minerals, like calcium and magnesium, impair the effectiveness of cleaning products like laundry detergent. Soaps and detergent just do not work well in hard water. Calcium and magnesium prevent water from mixing with detergent to form a solution. First, the water has to isolate the hardness molecules before it can dissolve in the water. Thus, you have to use more soap (or shampoo or laundry detergent, or bar soap, etc.). The soap that has to bind up with the hardness creates soap curd. Who doesn’t want to take a bath in soap curd? The resulting soap curd causes a scummy, scale-like residual that sticks to shower glass, shower curtains and YOUR SKIN! It is also left in the fabric you are laundering resulting in flat (not fluffy) and dingy clothing and towels. It will make your laundry feel stiff and flat. Your laundry will wear out sooner. Clothes Are Dull or Discolored? The soap curd will make your laundry look bad, too. Clothes and towels will wear out much more quickly and will not be as soft. The soap curd build-up in the fabric will cause it to be less fluffy, less soft, less enjoyable. Got lint? Lint is just broken clothes. As the fabric gets harder due to soap curd build up, as your clothes rub together in the dryer, they break down. That is the lint in your lint trap. Do you have other cleaning problems? Are there rust colored stains on your clothes when they come out of the washer? You may have iron in your water. You’ll likely see similar stains in sinks and toilets. You don’t have to have much iron to cause a big staining problem. Why Do My Towels and Sheets Feel Hard and Scratchy? Hard water doesn’t just make your laundry look bad, it feels bad! Who wants hard, scratchy feeling laundry? If you want soft feeling sheets and towels, shirts and pants, you have to get the hardness out of the water. By the way, that high efficiency laundry detergent you paying extra money for–includes chemical water softeners. Wouldn’t it just be nice to buy the cheap stuff and get great results? 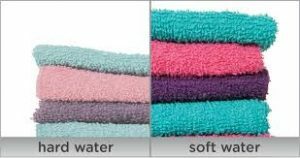 And..that soap curd building up in your towels won’t just make them feel stiff and scratchy, they will actually become less absorbent. Don’t you prefer soft and absorbent over scratchy and non-absorbent. Why Is My Skin Irritated? Hard water can also lead to skin irritation – especially if you already have sensitive skin or a dermatological condition like eczema. The hardness itself is not what causes the problem. But since your hard water makes you use so much extra soap products your skin is exposed to those additional products resulting in additional irritation. And, having a residue of soap curd on your clothes and bed-sheets rubbing against your skin could lead to an increase in redness, chafing, and dryness. Maybe you don’t need all of those lotions, creams, and special soaps. The answer may simply be softening the water. And, it’s now winter in Colorado. When the humidity is 15% do you really need stuff in your water that will make your skin feel even drier? Hard water forces you to use more detergent. As I mentioned, before the soap can just make soap, it has to coat the hardness molecules. Without hardness, the soap goes right to work. You will need to use more laundry detergent to get your clothes clean. More detergent means more soap curd! Laundry detergents may contain chemicals that aren’t environmentally friendly. Adding more detergent means you’re contributing more to water pollution. Don’t You Want Fantastic Laundry? Soft water is ideal for cleaning, and installing a Hague comprehensive water conditioner is a permanent solution to laundry problems, and others, from hard water in your home. We offer a FREE water analysis and recommendations. Let us help you fix your water!